Mosquitoes and other pests can be a painful nuisance at the best of times, and a serious health issue at the worst of times (i.e. West Nile Virus). Either way, mosquito control requires proper care and attention for your yard, trees, and life in general. Here are some practical tips about what works and what doesn’t when it comes to mosquito prevention and other pest control solutions in the Loudon County and surrounding regions. Mosquitoes must have water to breed. As we all know, there is no shortage of standing water in in the Fairfax, McLean, Reston, and nearby areas (for a full list of our service coverage at Growing Earth Tree Care, visit our Contact Us page). 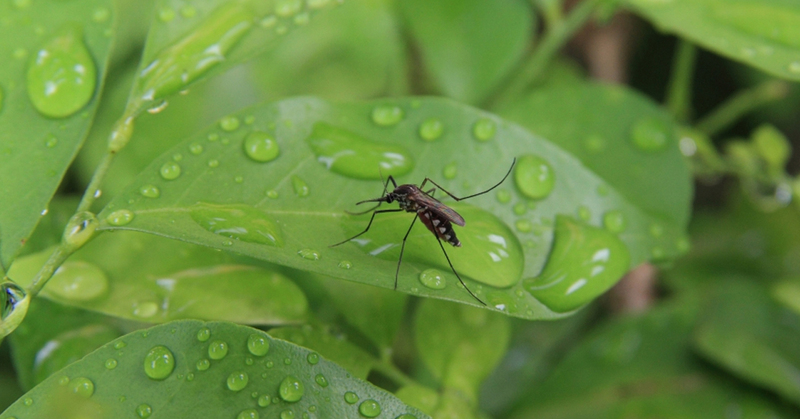 Full-grown mosquitoes lay their eggs in slow moving or standing water. Most people already know this, but did you know that they can also lay their eggs on wet soil or leaf litter areas prone to collect water? Congratulations if you did. If you didn’t, there’s your first tip; eliminate those leaf litter areas and moist soil sections as much as possible. Mosquitos can also hatch within trees themselves if conditions are right. By taking care of these water sources, you’ll stop mosquitoes from breeding which eliminates future generations from harassing and endangering you and your family. Here are a few pest control solutions about home mosquito control that will help you prevent the pest problem before it starts. Don’t drill holes in the sides of your garbage containers-drill homes in the bottom. Holes on the side still allow water to enter at an angle and provide a perfect breeding ground for mosquitoes. Keep swimming pools both chlorinated and cleaned even if it’s the winter and you haven’t used it in a while. Keeping it chlorinated is key because it doesn’t take long for your pool to turn into, you guessed it, the perfect breeding pool. Get rid of old or superfluous water containers. Yard debris, tree stumps, buckets, old tires, drinking glasses or cups, fountains, birdbaths, plant pots, animal drinking containers, and even barrels without the appropriately screened covers. Earlier we talked about moist, or swampy soil. You’ll need to improve that ground as much as possible. Drain or fill up these ditches and soil depressions that can get soggy to prevent the gathering of water. According to the American Mosquito Control Association, ditches containing stagnant water for over a week can produce large numbers of mosquitoes, in case you didn’t take our word for it, or you’ve never lived in Virginia during the summer. Mosquitoes like standing water. So let’s get that water flowing. If you have an ornamental pond, consider aeration to prevent both egg-laying and hatching. Install a fountain, use an aeration pump, or maybe your own invention to get that water flowing so you can keep your yard yours, and not belonging to the enemy! There’s a belief out there that coffee grounds can kill mosquito larvae. Supposedly the coffee grounds cause the eggs to rise to the surface, which in turn deprives them of oxygen, making them bite the dust, instead of your children. Research has backed this claim up to a degree, but the study also found that if the concentration of coffee grounds was too low, it would in fact have an adverse effect and boost the “larval survivorship”, as the scientists put it. So we, like the researchers performing the study, are non-committal about recommending this environmentally friendly mosquito control practice. We would advise you to use a whole mess of coffee grounds if you do choose to go the experimental route. Mow your lawn regularly. Mosquitoes need to stay out of the heat of the day, so they will tend to rest on tall weeds or grass. Weed your weeds regularly as well and prune your trees and branches as part of your tree care routine. At the end of the day, an ounce of prevention is worth a pound of cure. We at Growing Earth Tree Care we provide disease and pest diagnosis and control. So if you have taken these precautions (or even if you haven’t) and can’t feel comfortable even in your own yard, it’s time to call in the best pest control company in Virginia. We excel in keeping your trees and yard beautiful. We offer safe, affordable pest control with a free estimate included. Please consider us for all of your pest control and tree care needs.